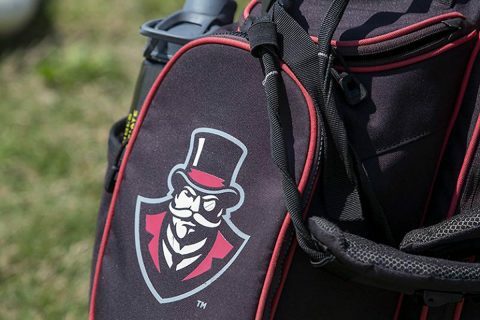 After 18 holes, the Govs are just outside the top-five after a six-under 282 left them tied with Valparaiso and South Dakota and one shot behind Bradley and Stephen F. Austin. Campbell (269) leads the way at 19-under, with Delaware (276) and Gardner-Webb (278) rounding out the top-three. The Govs were clearly the class of the Ohio Valley Conference in Round One, leading Jacksonville State by 11 shots and Tennessee Tech by 14. If Knisley’s opening round as a collegiate player is any indication, the Govs could have another OVC Freshman of the Year on their hands. He ripped off a 31 on the back-nine, opening his college career with three straight birdies and five over his first nine holes to flirt with the top of the leaderboard. He settled for a three-under 69 and tie for 11th after round one. He took advantage of the course’s length, averaging a team-best 4.40 strokes on par-5 attempts. Par-5 shooting was good to Austin Peay in general in the first round; two of the course’s five par-5 attempts (No. 9 and No. 15) were birdied by Knisley and juniors Alex Vegh and Michael Busse. The Govs averaged 4.76 strokes/hole on par-5 attempts, fourth-best in the tournament as a team. Sophomore Chase Korte and Vegh reside just outside the top-20 after Day One, shooting matching 70s to tie for 21st. Vegh carded a team-best 34 on the front nine, while Korte shot 35 on the front and back. Vegh also birdied the 208-yard, par-3 No. 16, which played as the toughest hole on the course during Sunday’s round. Sophomore Garrett Whitfield consistently got up-and-down, leading the tournament with 15 pars en route to a one-over 73 on Sunday. Busse’s 75, which featured five birdies—tied with Vegh for second-most by a Gov—rounded out the Austin Peay lineup. The Govs tee off for Round Two beginning 7:30am (CT), Monday, on Hole No. 1. The Govs will be paired with Bradley and Stephen F. Austin for the second round.